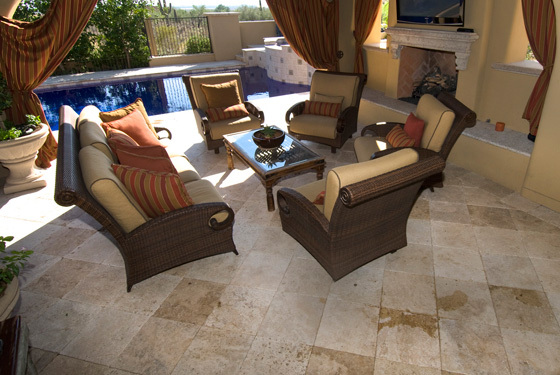 Travertine pavers are installed in this multi level pool and patio area. 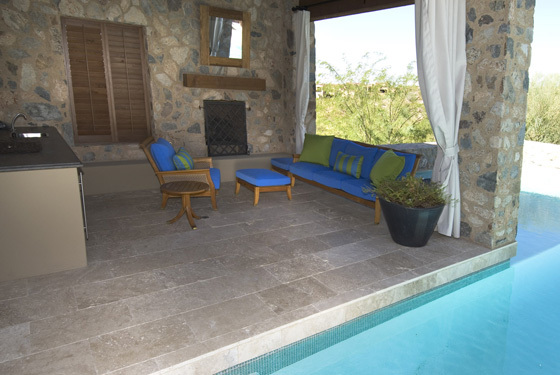 Smaller patios, the Cabana and kitchen area and the pool deck all break the size of the deck into more intimate areas. 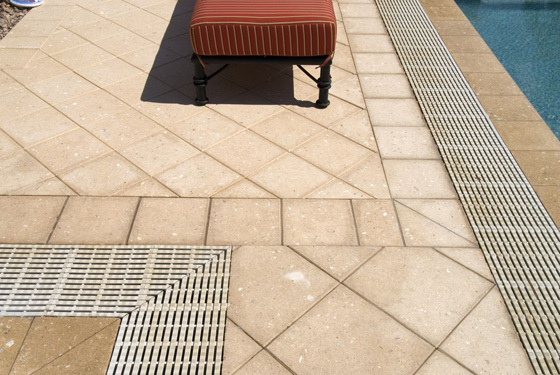 Stepping stones in the grass also break up the mass of the deck. 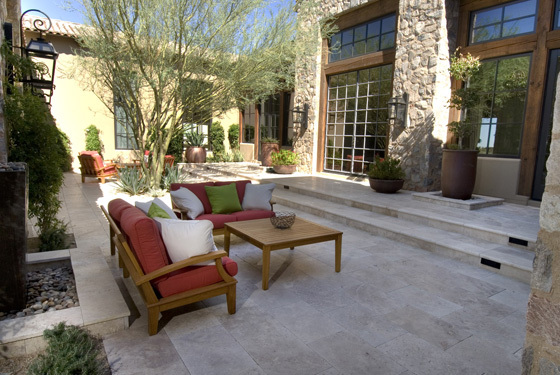 The travertine colors help with the Arizona sun and tie in with the homes architecture. 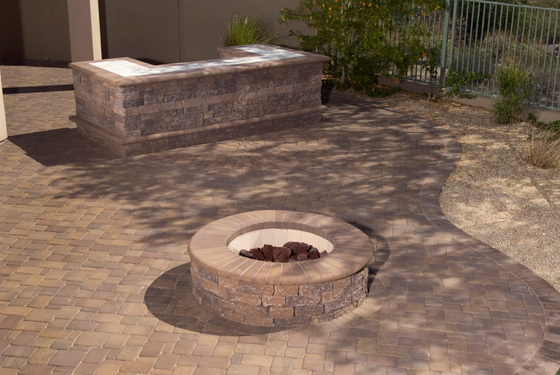 A paver veneer ( 1 ¼” thick ) is installed over the top of the existing patio and cool deck. 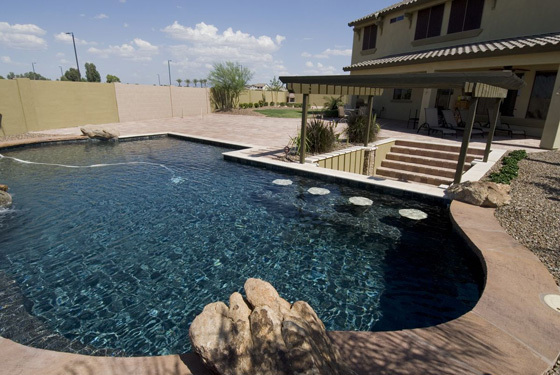 Going directly over the top of the cool deck saves the homeowner having to tear out the concrete which reduces the cost of the pool remodel. 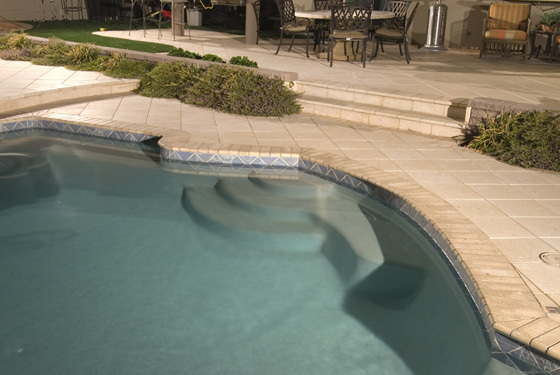 Paver coping stretches down to cover the concrete at the edge of the pool. 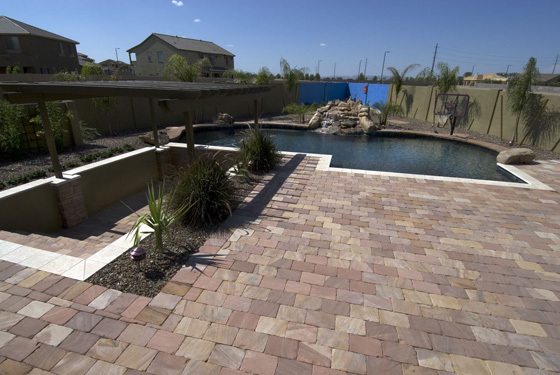 At the completion of the project, the owners have a brand new patio and pool deck without having to break out the old. 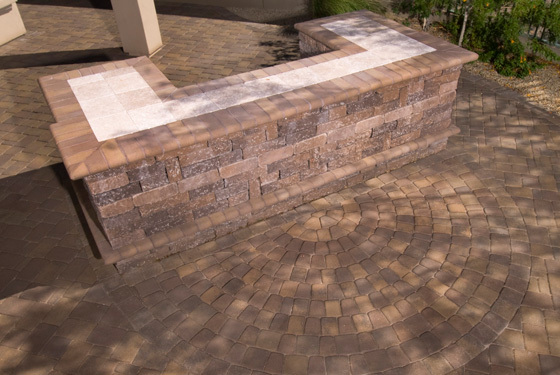 An exercise area was created using a “Yin Yang” design. 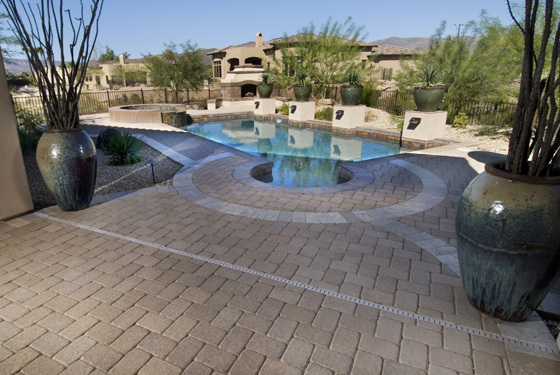 Solid contrasting paver colors are used and the patterns were cut at exact locations and angles. 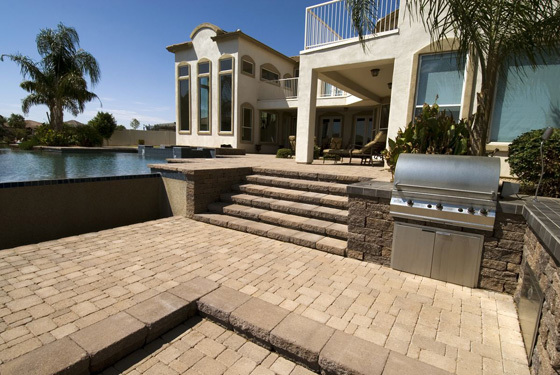 The layout and angling of the deck was exact to keep everything in harmony. 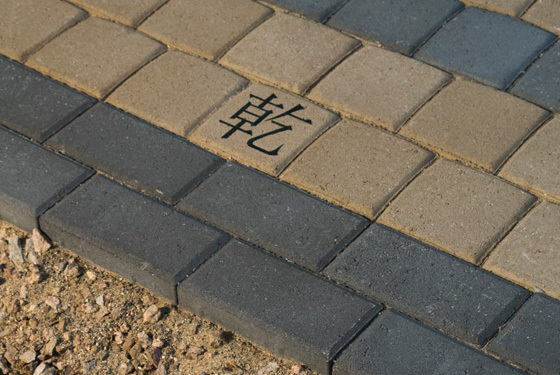 Chinese symbols are sandblasted in to the pavers on each of the eight sizes to complete the design..
A custom designed spiral symbol is at the center of this driveway. 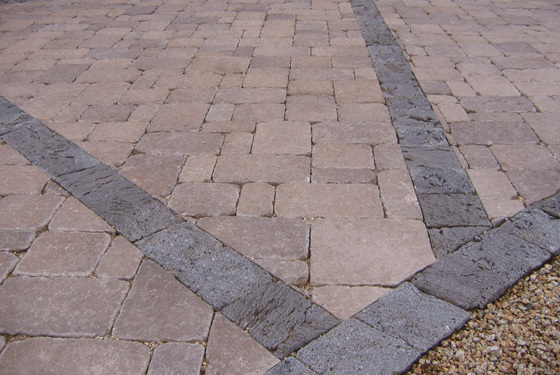 A Splitface paver highlights the design as well as providing a contrasting texture in the border. 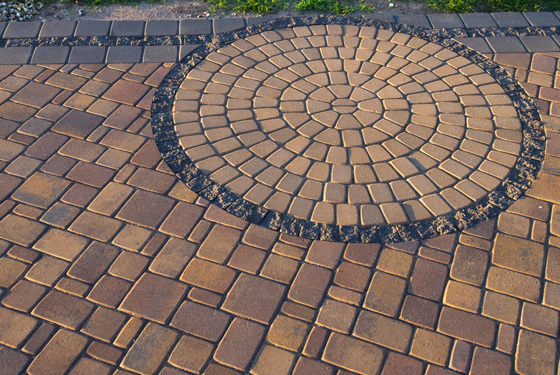 Circle pavers are used to create a unique walkway to the front entrance. 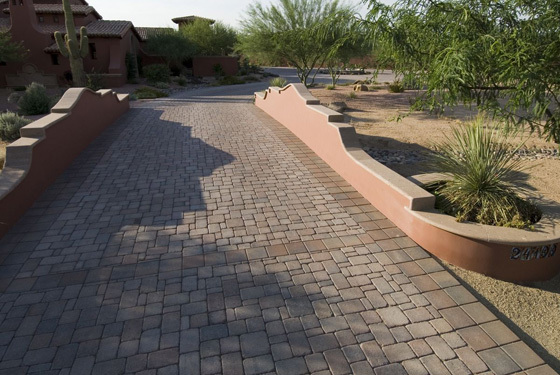 Tumbled pavers and natural stone combine to create a unique Arizona driveway. 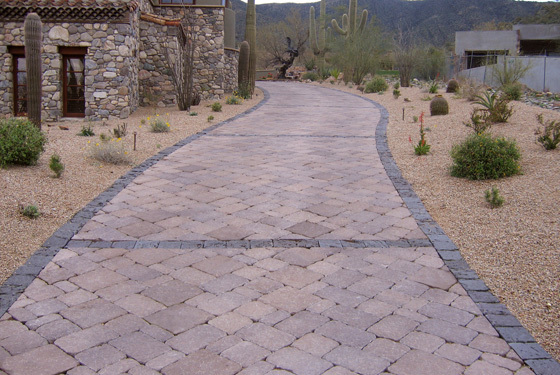 The natural stone, quarried in Northern Arizona, contrasts with the tumbled pavers to create distinctive bands across and along the driveway. 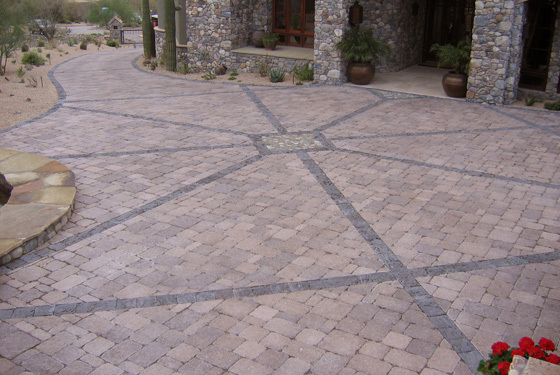 Small river rock inserts are centered on the main entrance and the visitor is led to the front entrance by the bands. 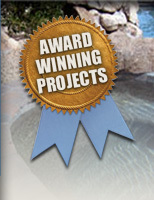 Travertine pavers are used both in the auto court and in the patios, walkways and pool area. 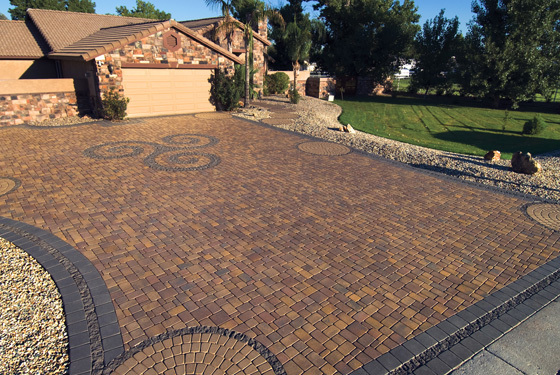 The auto court is a combination of two colors laid in an eye catching pattern. 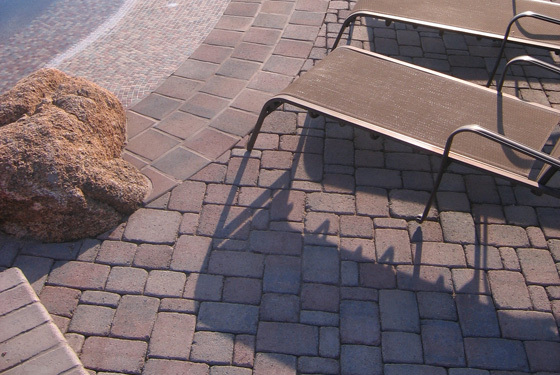 The patios are installed in a running bond pattern. 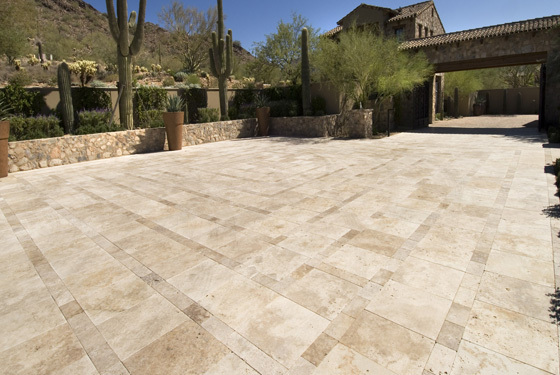 Travertine pavers were chosen for their size, colors and because they are cooler to walk on than concrete pavers. 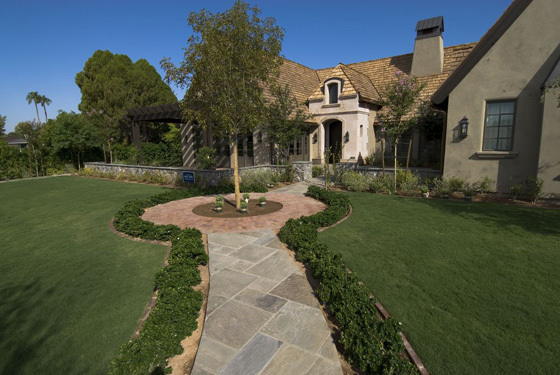 The laying patterns and the natural stone colors complement the homes architecture. 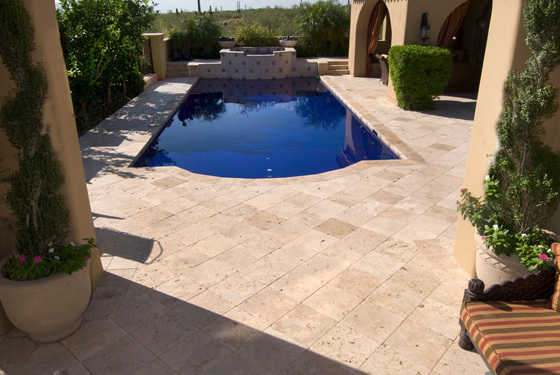 This patio and pool area combine standard pavers laid in a classic herringbone pattern with travertine pavers used in the border and in bands throughout. 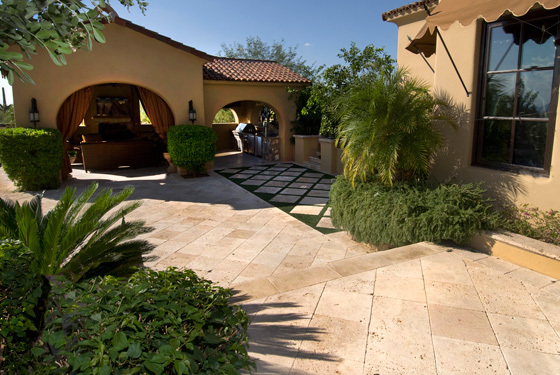 The use of bands and the changes in elevations create different entertainment areas throughout the yard. 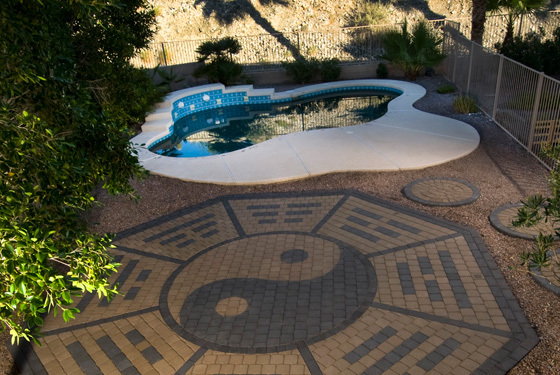 Artistic Pavers are used throughout this multi level pool and patio. 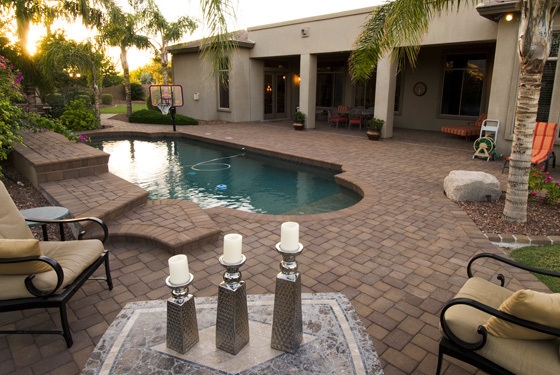 The owners have young kids and choose a material that would allow them to walk on the surface in the middle of the Arizona summer. 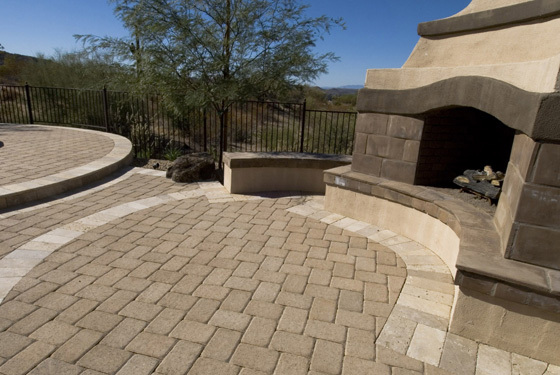 Artistic pavers were the solution. 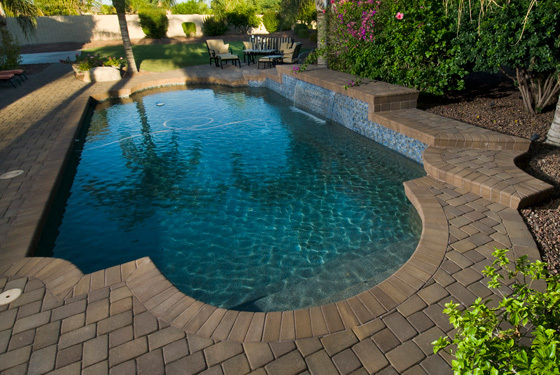 Installed on a classic diamond pattern with bullnose pavers for the coping and steps, the patio and pool are both functional and beautiful. 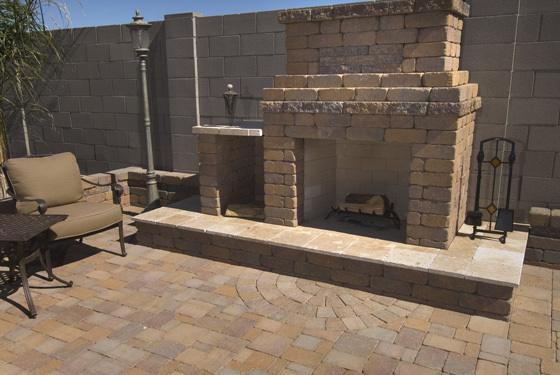 The tumbled paver patio extends out to a raised patio that features a custom fireplace, seat walls and a barbeque surround. 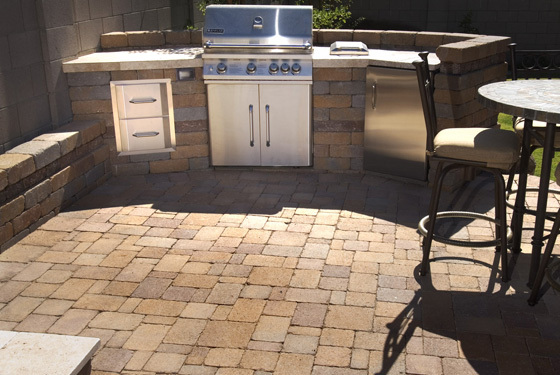 Travertine pavers are used for the hearth and for the BBQ countertop. 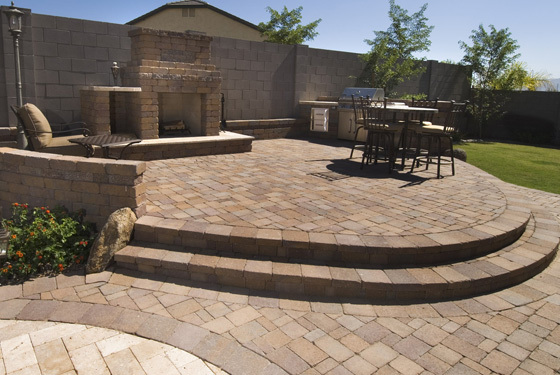 This entertainment area allows the homeowners to take advantage of our great Arizona weather. 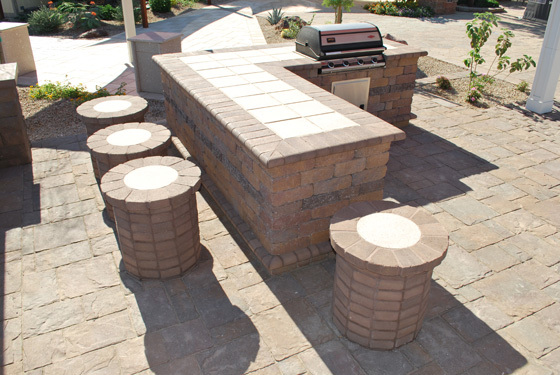 Contrasting wall units were used to construct this custom barbeque. 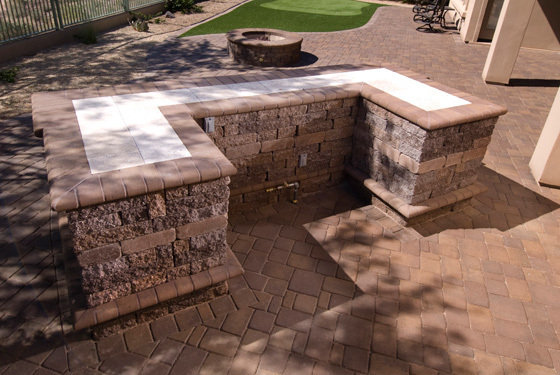 Two styles of wall units and a bullnose paver were used to create this unique hardscape BBQ. 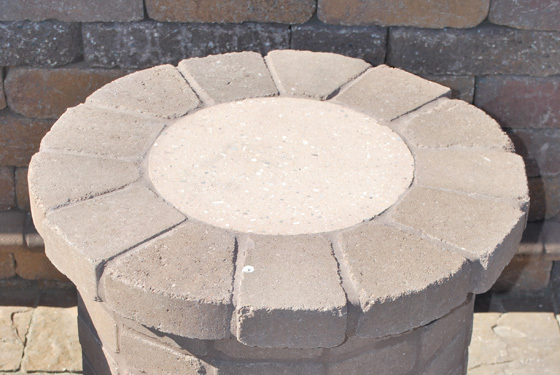 The bar stools were built with circle pavers and a travertine seat to match the travertine counter top. 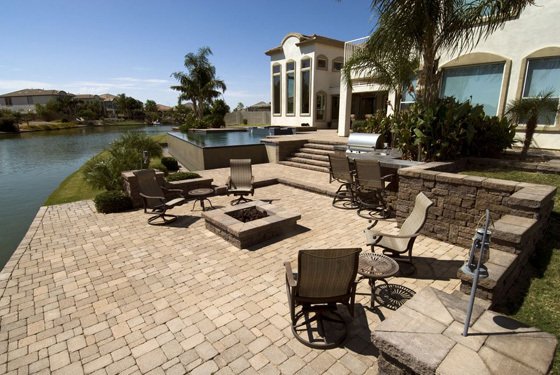 Patios and pool decks all set at different elevations, connected by steps constructed with block and pavers, combine to create a stunning backyard landscape. 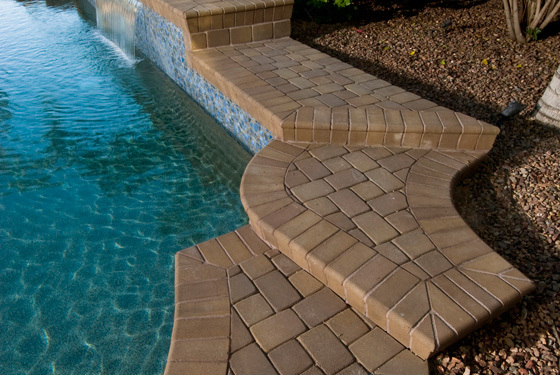 Pavers are used as coping for the pool, spa and steps. 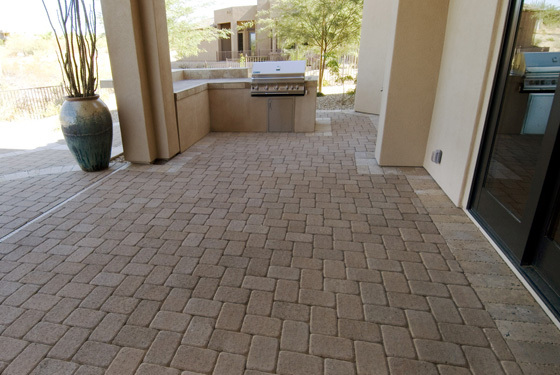 Tumbled pavers installed in a random pattern are used throughout the patios. 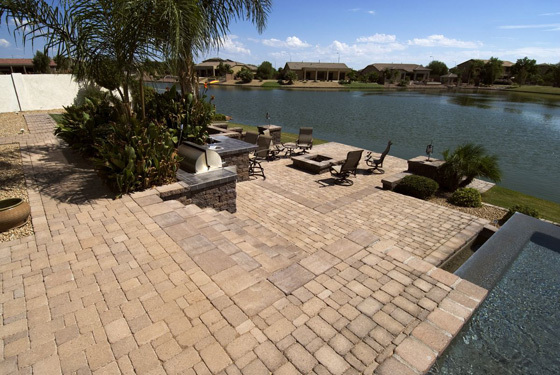 A combination of tumbled pavers and Celtik Wall retaining walls are installed at this beautiful home overlooking a lake. 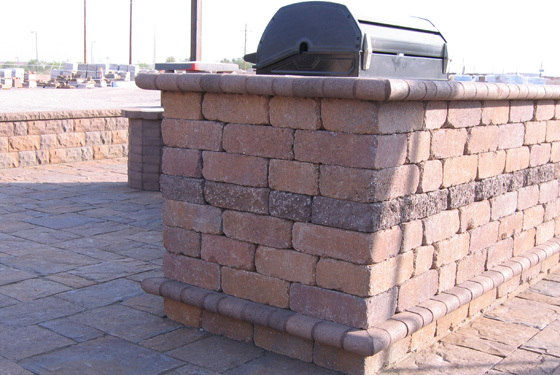 Celtik Wall is used as a retaining wall, steps, a fire pit and a barbeque. 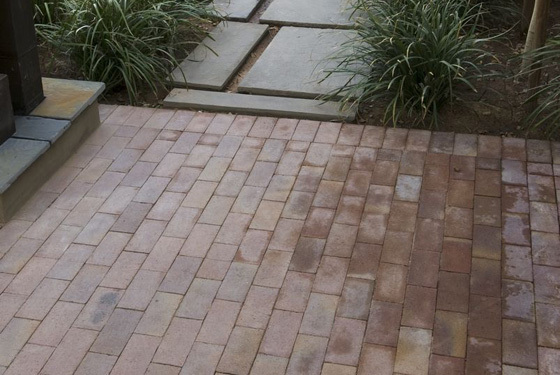 The split antiqued texture of the Celtik Wall ties in with the tumbled four piece paver pattern. 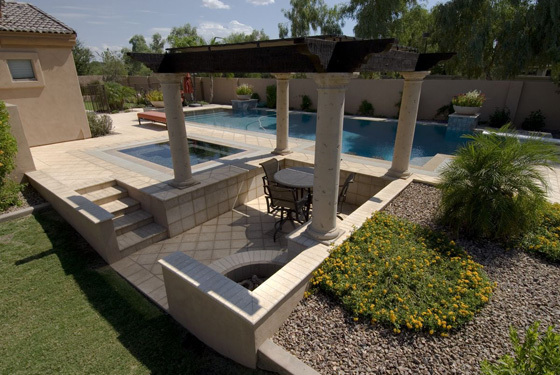 This outdoor living area allows the owners to spend a lot of their time enjoying the Arizona weather. 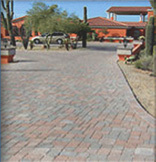 Tumbled pavers in a random pattern are installed with a double standard border in this large driveway. 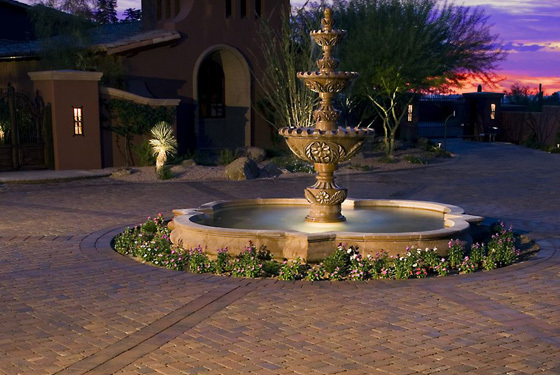 The large driveway is broken up with bands that are also used in the wagon wheel around the water feature in the front. 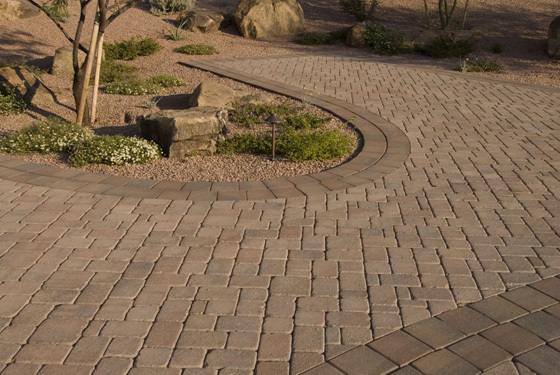 The contrasting paver textures give a unique appearance to this driveway. 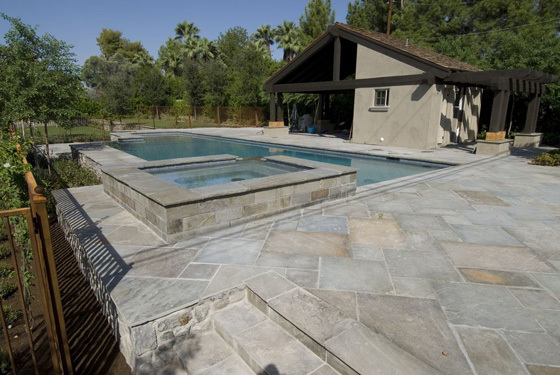 A natural stone paver from Nevada is installed in a running bond pattern and a marble bullnose coping is used around the pool and sunken bar area. 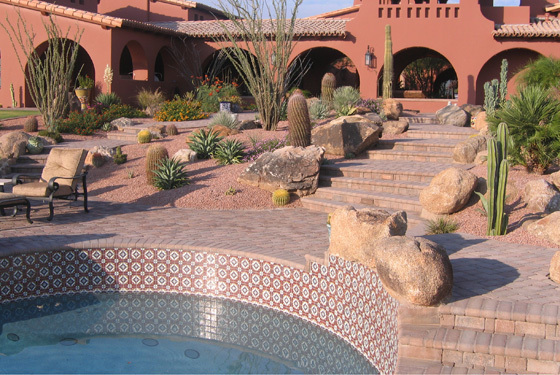 The natural stone has a wide range of color. 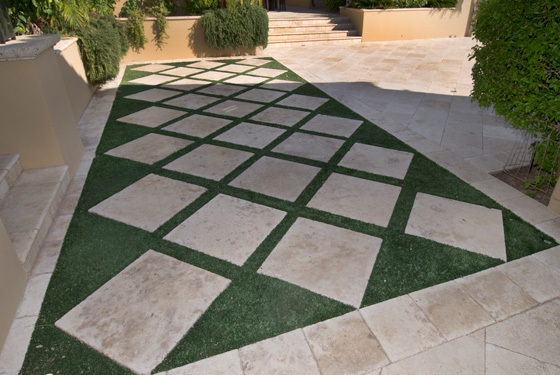 The simplicity of the stone and the laying pattern all create a clean, simple but beautiful appearance. 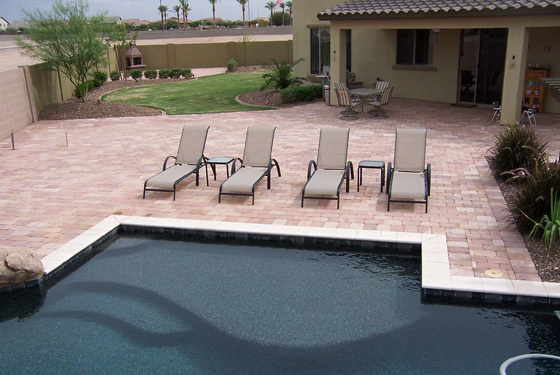 Artistic Pavers installed on a diamond pattern are installed in the pool and patio area. 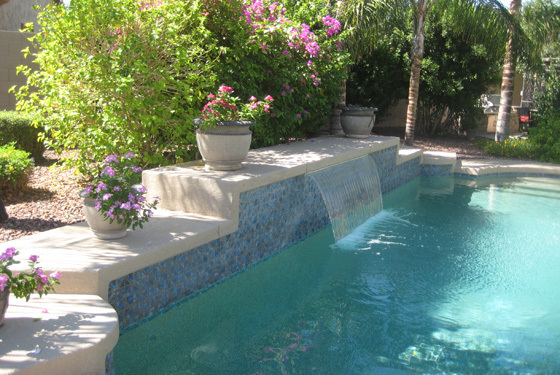 Water runs over the Artistic pool coping and smaller paver coping sizes are used on the top of the walls. 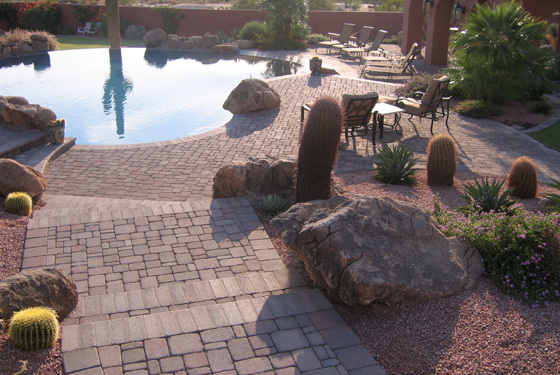 The Artistic pavers work great with the Arizona sun and the different sizes give the owner great flexibility in design. 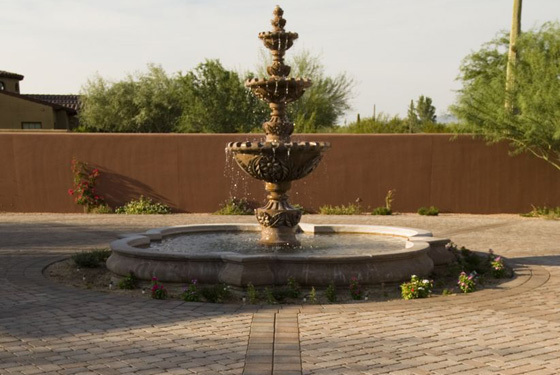 Over 5,000 square feet of Bluestone is used in the front entrance, sidewalks, patio and pool area. 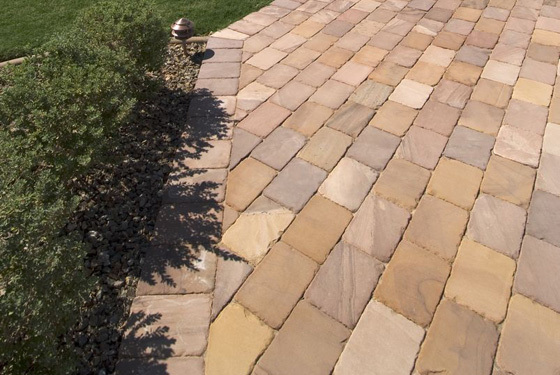 The Bluestone colors and textures are used in a combination of sizes throughout the yard. 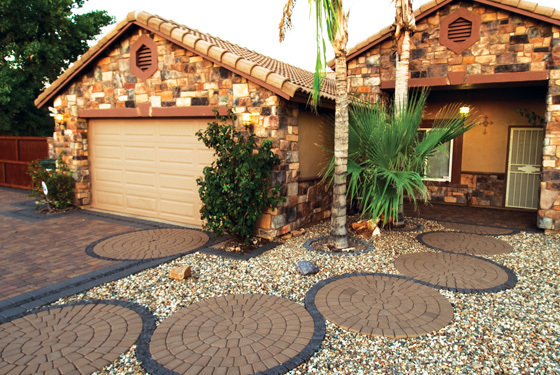 Stepping stones connect patios and brick and concrete pavers are used in the driveway and patios. 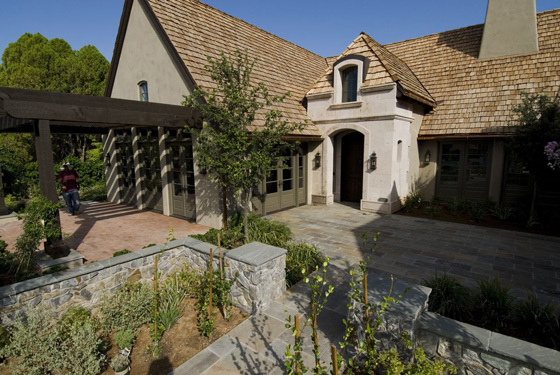 All the products combine to give the home the old world charm that the owner was looking for.